Times are tough out there, and the success of Marvel movies is clearly a sign that we as a people are desperate for heroes in our lives. It’s important to remember that heroes come in all shapes, sizes, and, apparently, degrees of sobriety. 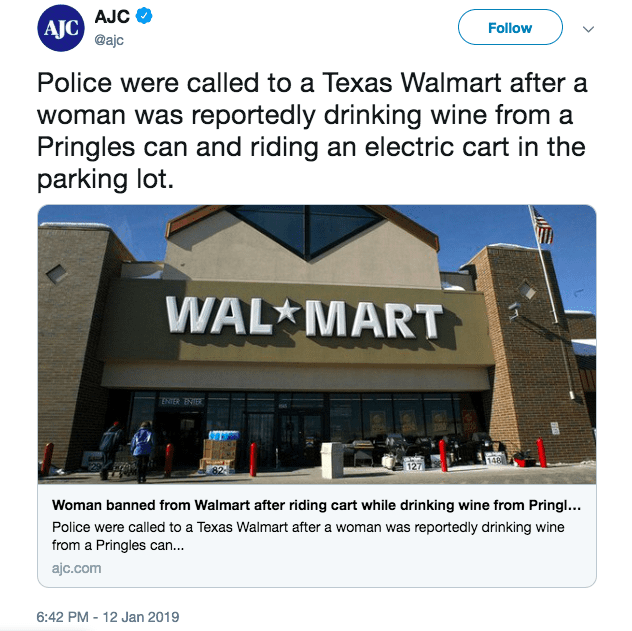 This week, a new hero emerged, and the world was quick to embrace the Texas woman for exactly who she is – a woman who rides motorized carts around a Walmart parking lot while guzzling wine out of a Pringles can. 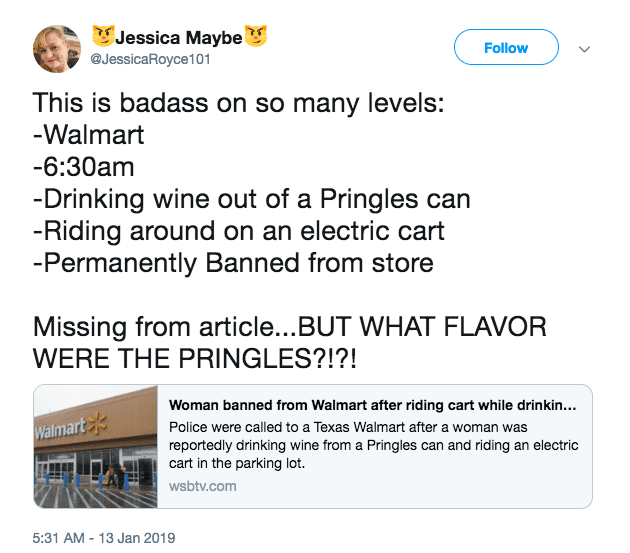 No word on what kind of wine or what kind of Pringles, which only proves that people reporting the “real” news don’t understand what we all need to know. The woman had been galavanting about since 6:30 in the morning and was still at it when the police arrived at 9. All joking aside, if her mental state is precarious or worse, I hope that she gets the help that she needs. If she was merely capping off a great night with friends, then more power to her. 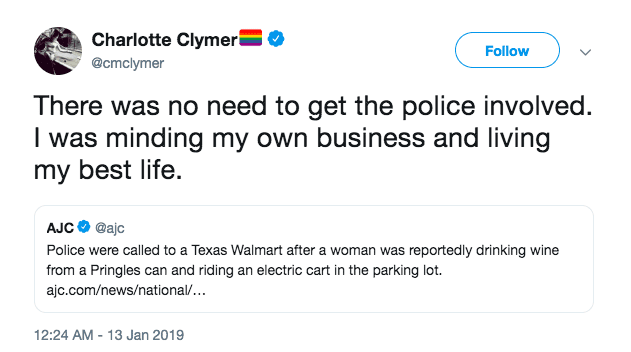 The Walmart permanently banned her from their store (which is pretty much a blessing in disguise, if you ask me), and most people online seem to see nothing but a woman interrupted while living her best life. This is America, after all, and she wasn’t hurting anyone or herself. 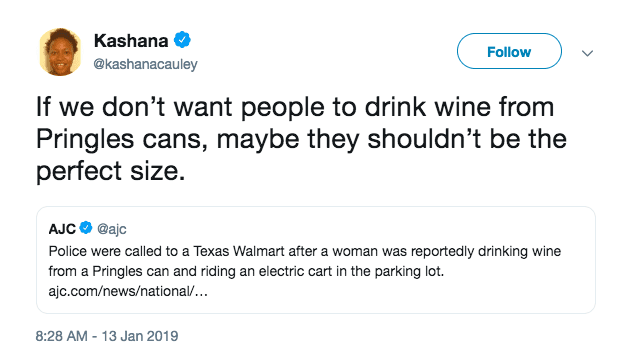 The responses are almost as funny as the story’s headline, with most people choosing to see her as a great symbol of someone with no f*cks to be given. We can all agree that the woman should get help if she needs it, but otherwise, I agree with the masses and say more power to her.